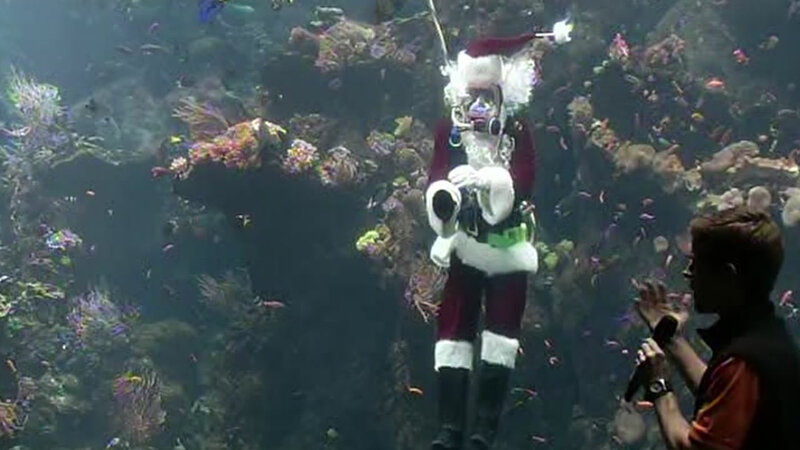 SAN FRANCISCO (KGO) -- Santa hit the water Monday when he went scuba diving in a coral reef tank at the California Academy of Sciences in San Francisco's Golden Gate Park. Santa took questions from kids while he was underwater. Afterwards he talked about the experience. "It's not the easiest dive in the world, especially when you get out, it's full of water, a lot of weight to lift up, but it's fun, worth doing," said George, a volunteer diver. "I've been doing this for years, someone asked the names of the reindeers, and fortunately I had that one down." If you want to see Santa underwater the daily Santa shows begin at 11:30 a.m. and runs through Thursday.